At the beginning of the week, I asked you, my cherished readers, to give me your opinions on a sensitive but important subject: the diversity of characters in fantasy novels. It’s not the easiest topic to talk about, especially because the arguments on every side can quickly devolve into name calling and finger pointing, privilege shaming and plain old ugly racism. This is especially common on the internet, where anonymity brings out the worst in us all. I am happy to report, however, that all of my participants took a thoughtful and respectful approach to these questions, and I feel no need to filter or censor any of the responses I’ve collected. Thank you all for contributing positively to this experiment. So let’s get down to the data. I didn’t receive a ton of responses, but I think I’ve got enough to draw some broad strokes. Respondents were evenly split between the 18 to 29 age group and the 30 to 50 age group. The majority of respondents were comfortable self-identifying as “male” or “female” (63 percent male), while a couple of people considered themselves to be elsewhere on the gender spectrum. Y’all are really white. Only two respondents said that they were not of white/Caucasian/Euro-American descent. There was a little more variation with sexual orientation: a few not-quite straight participants, a few bisexuals, and a few who said they were gay. How do you define a “diverse” character? The answers to this question sort of surprised me. While I intended the word “diverse” to mean “non-white/straight/male/culturally stereotypical,” not all of you interpreted it that way. A third of you said that a “diverse character” is simply a character with emotional depth and personal agency, and didn’t even mention race/gender/cultural/sexuality…which kind of makes me wonder what kind of books you’re reading where those characters are uncommon enough to be notable. Do you seek out or gravitate towards fantasy novels that promote the presence of “diverse” characters? This isn’t really a big deal to most of you, which could be viewed as a good thing or a bad thing. But it can also be interpreted as “readers only care about good stories,” which I think is what most of you intended to communicate, based on the next few responses. 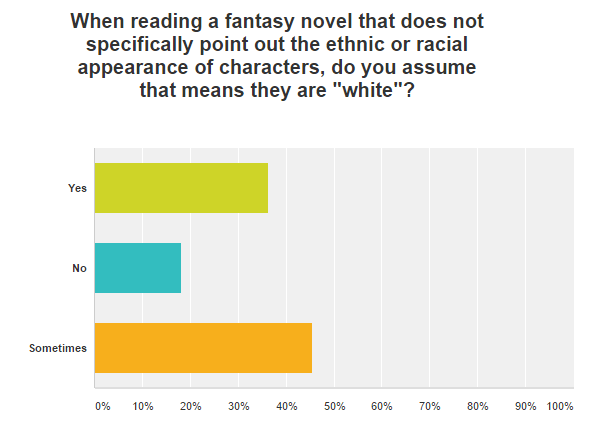 When reading a fantasy novel that does not specifically point out the ethnic or racial appearance of characters, do you assume that means they are “white”? Here’s where the mostly-white participants get kind of telling, and depending on your perspective, the answers might seem a little…meh. First of all, my non-white respondents all said “no” to this question, and didn’t seem too bothered by the issue. Several participants of all backgrounds said that the character him/her/itself is significantly more important than their skin color, and added that they would simply change their mental image of the character if the author revealed a new detail about their appearance or history. Do you believe that “white” authors can authentically create characters with different ethnic or cultural backgrounds? No one said that they don’t think white authors should attempt to write characters of different backgrounds, or that most of the time white authors get characters of other backgrounds painfully wrong. Do you believe stories that do not include a high proportion of “diverse” characters are inherently less valuable for modern readers than stories that do? 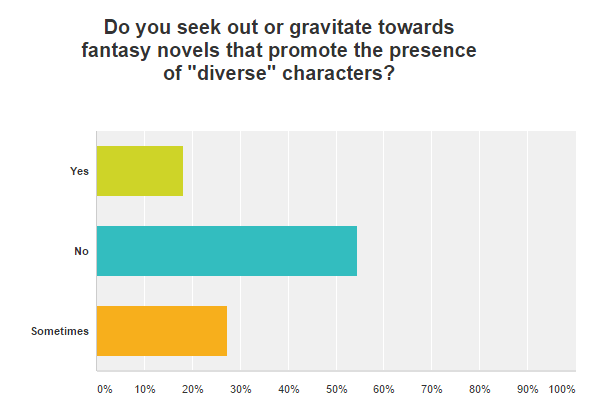 The vast majority of you said that you don’t make value judgments about stories based on the diversity of characters…but the vast majority of you also don’t have to look too hard to find characters you can relate to when reading fantasy novels. This is where I was hoping to get some more responses from people of non-white backgrounds, because the question was aiming at how traditionally underrepresented groups feel about the current state of the genre. So I’m not sure this piece of data accurately reflects much of anything. Note: I have purposely not addressed the whole issue of young adult literature in this survey, because I think it’s a much more complicated question for a different audience. While it’s important for readers of all ages to be able to identify with and relate to characters in the books they read, I feel like it’s even more important for teenagers still rapidly developing their sense of self to have access to books with characters that make them feel accepted, normal, and part of the world they live in. As an adult, I don’t feel desperate to find clues to my place in the world from my fantasy books. As a teenager, I absolutely did. If I was a teen who didn’t more or less fit the straight white female demographic, I may have been very disappointed in the available selection. I am glad to see this is changing in the YA world, even if I’m not too keen on the rest of what YA literature tries to achieve. 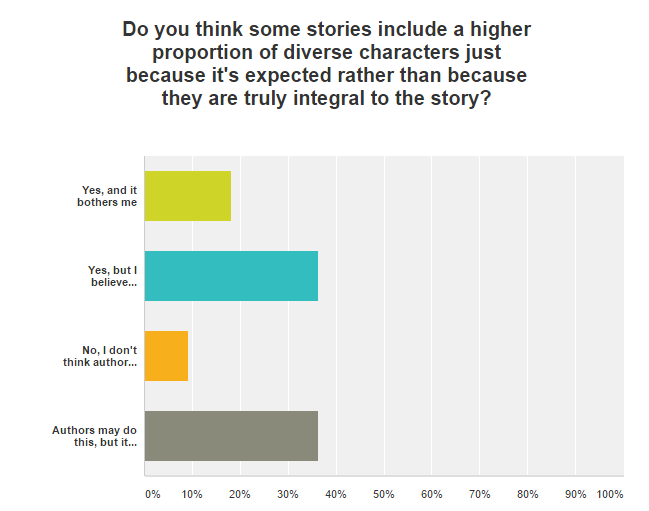 Do you think some stories include a higher proportion of diverse characters just because it’s expected rather than because they are truly integral to the story? I would like to agree with you here, but then I think back to my frustration and rage at half-hearted, one-dimensional attempts at inclusion like Tauriel in The Hobbit, and I have to stand by what I said at the time: I would rather not have a token character than one that is done so badly. Fair point, but I still hate Tauriel. What are your other thoughts on diversity in fantasy? I’m going to share these without comment, because I agree with some of them and disagree with others. I would be happy to see you all discuss the issues raised here in the (moderated) comments, but since each of these responses could spark an entire series of blog posts on their own, I don’t want to take too much time dissecting everything. Each response is from a different participant. Overall, I think this survey was an interesting and positive experiment. I’m going to leave it open for more responses, in case anyone missed their chance to participate but wants to speak their piece. If I get a lot more, maybe I’ll do another roundup in the near future. For now, please do share your thoughts in the comments. Were you surprised at some of the answers? Taken aback? Pleased? What jumped out at you? Be vocal! Let me know! Thanks so much for doing this. Even though your respondents were overwhelmingly white, just thinking about diversity (and discussing it) is a great thing to promote. I was struck by the thoughtful nature of all the responses.